Scanners have become such an affordable option for most people that it just makes sense to invest in one if you have old photos or slides laying around. Imagine how much better you would feel if all of those old family photos were safe on your hard drive rather than just sitting in a box in your closet. There are many great photo scanners to choose from and the Epson Perfection V500 is certainly one good choice. Epson actually makes a few different models of photo scanners allowing would-be buyers to get a scanner that fits their needs at a price they can afford. The only difficulty sometimes is trying to figure out what is or isn’t included with a given Epson model. Let’s go through some of the features of the Epson V500 while comparing it to some of the other offerings by Epson to help you make the best choice. 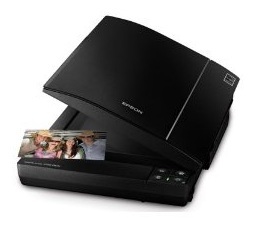 The Epson V500 offers a maximum optimal resolution that is more than enough for photo scanning. The only time you would likely ever need to scan at 6400 or even 4800 dpi is when you are scanning film products like slides or negatives. It is easy to think that a scanner with higher resolution values is automatically superior, but that isn’t necessarily true. It really depends on what you intend to scan. The Digital ICE technology from Epson is a combination of hardware and software functions that work to remove dust and scratches from film slides. Note, while the Epson V600 offers Digital ICE for both film and photo prints, the V500 does not. If you are interested in the Digital ICE function for photo restoration then you will need to look at the V600 instead. The Epson V500 also has some features that are common to almost all Epson scanners. That includes the Epson Scan software with incorporated Easy Photo Fix which basically provides one-step color restoration to faded photos and slide. The OCR software is also a standard include and allows for easy conversion of scanned documents to editable text. 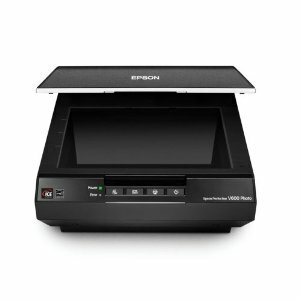 The V500 is compatible with both Windows and Mac operating systems as are most Epson scanners. One addition to the software package with the Epson V500 is the inclusion of Adobe Photoshop Elements. This software is also included with the V600 and V700 but not the lower-priced V300 photo scanner. 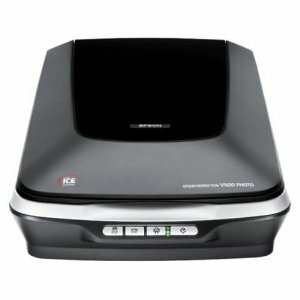 The option to add an automatic document feeder (ADF) is unique to the V500 and V4490 scanners by Epson but comes at a pretty high price ($200). If you know that you want the ADF, be sure to check out the Epson V500 Office scanner which comes with the ADF included but at only $150 more. Like almost all of the Epson photo scanners, the V500 is designed for scanning film, slides and negatives in addition to photos. While I noted above that you wouldn’t need 4800 dpi resolution for scanning photos, you will need higher resolutions for the scanning of film products, especially when creating enlargements. The V500 comes with film and slide mounts for both 35mm film and medium format film and can scan 4 slides per run, same as the V600 but less than the V700 slide scanner. Customer reviews of the Epson V500 are generally very positive. Most people were happy with the quality of the scans, especially with regard to photographs. Two of the complaints made were not unique to the V500 but also apply to other Epson models and that is the lack of a printed manual and concerns over the “flimsy-ness” of the film mounts. I will note that there is a user’s manual available on the Epson website. If you are looking for a good, mid-level photo scanner the Epson Perfection V500 is certainly one to consider. It isn’t the cheapest and it isn’t the most expensive, but it has many great features for the average person with a pile of pictures to scan. If you are debating between the V500 versus the V600, remember that the V500 does not offer the Digital ICE function for photo prints. 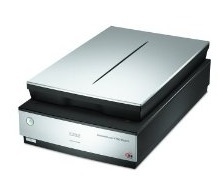 Otherwise they are very similar models and both top-selling photo scanners.